for me, you’re anyway a winner, vektor! 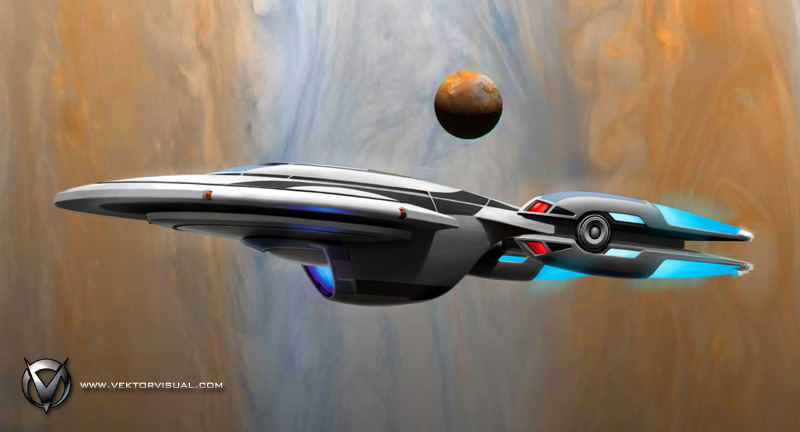 your ent-f looks awesome and i loce the nacelle design. hope to see more of it. btw. i voted for ypo at sto….. Personally, I always felt that the engineering hull could stand to be a bit more rounded. Shave a few decks off the bottom, widen it a wee bit to recoup on the lost volume. I know you’re not hot on doing away with the pronounced ‘U’ hull as a matter of retaining character, but believe me it would do wonders for the ship’s profile. You could make a similarly-designed navigational deflector in a semicircle easily enough. Love your design, by the way. Gratz for placing in the Top 25. Of all the contest submissions I’ve seen, this is the only one in the hunt IMHO. Good luck – you’d get my vote. What a great and wonderful design, I liked the original design with the scoop up flush saucer back. Either way it looks good! do you know that your design is a runner-up? personally, i like the open scoop mouth, it reminds me of Boeing’s X-32 in a positive yet underappreciated way. at least you can take pride that the folks at cryptic and the judging panel appreciated your bold design – risk is part of the business, as they say..
Seen the contest winner – not feeling it. Yours stands alone as the only one looking professionally designed and screen worthy. Its only real competition was plagiarized. The design winning criterion over at Cryptic remains, well, cryptic to me. Your “Runner Up” ran away with it by mine. I’m aware of the outcome of the contest. If there’s any order to the listing of the runners-up, I apparently placed 9th overall, which I’m pretty happy with given the number of entries. My congratulations to Adam Ihle on his winning entry. I think he came up with a fantastic design and I can hardly wait to see how the in-game version turns out. Thanks to everyone for the kind words and comments on my design. I’ll come back to this painting and perhaps even a 3D version of it eventually, but I have some other projects I need to see through to completion first. So here’s the deal. Your latest drawing is a quantum leap above and beyond your submission contest drawings. Maybe its the smooth texture of the drawing that gives it a very futuristic look. Your previous drawings had an edge to them, problem solved with your latest design. Lets get real, the winning design simply is not in your league. Kudos to you. Anyone else here think that Vektor’s ship would make a really sweet replacement for the Jupiter-class Dreadnoughts? I love This Ship. You really should see if you can get a modeler license or permission or whatever from Paramount. It really is that good. Hey, it looks like you were the favored entry of Captain Logan from STO. Ten minutes in, you see a really interesting new design from Captain Logan in terms of redesigned Voyager. It takes a cue or two from your Enterprise-F design, but I won’t spoil it for you. 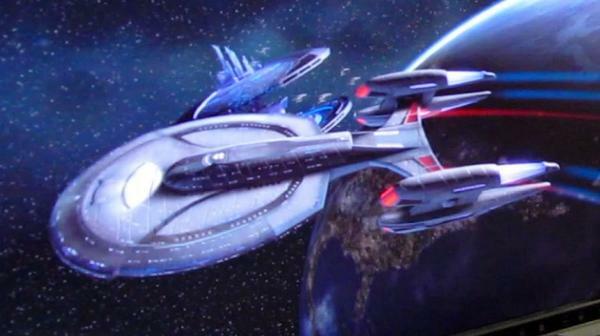 Not sure if you’d already heard, but your ship actually did make it into STO as the Chimera-class destroyer (exclusive veteran reward). Makes it about the fourth or fifth DTNE submission that got used after the Enterprise itself, and also the most least changed from the original aside from the Exeter. Yep, I’m aware of it. Cryptic got in touch with me several days ago and asked me to give them a brief write-up on the design to be posted on the STO blog on Monday. I’m pleased that they did such a faithful implementation and I hope everyone has a lot of fun with it. Just came from the STO page about your ship design. I wanted to say the design is brilliant, really well made and thank you for it. It deserves to be in STO and was definitely one of the best in the contest. Congratulations on becoming part of Star Trek history! Thanks, Hugh. Glad you liked the design. I am so pleased your ship is in the game. I am using it on couple of my characters after becoming a lifetimer. I love the tactical mode, that was your idea right? Cause I haven’t seen anything here about it. It looks way sexier here then in game though, maybe you can work on some variants that Cryptic can put in as costumes for us lifetimers to use on your ship design? Tactical mode was NOT my idea, though I do think it’s pretty cool. I think my involvement with it on Cryptic’s end is concluded, however, so probably no more skins or other mods from me. Glad you’re enjoying it, though.